Over the past six months, Kyann Flint, our Chief Accessibility Officer, has stayed in multiple hotels under the IHG umbrella. She stayed at two different Holiday Inn Express hotels, one Holiday Inn, two different Staybridge Suites, and one Candlewood Suites. Her parents also stayed at two additional Holiday Inn Expresses and asked to check out an accessible room at each location. IHG hotels vary greatly amenities-wise, which may be a perk to appease different travelers. However, the accessibility also varies greatly between each hotel branch which is not a perk to travelers with disabilities as they have no idea what to expect from hotel to hotel. The Holiday Inn Express in Pullman, Washington, to Kyann’s knowledge, has at least two different types of accessible rooms – Kyann stayed in one type of accessible room while her grandparents had a different type. Kyann’s room had a roll-in shower; her grandparents had an accessible tub, and both are specified as mobility rooms. Kyann’s roll-in shower while staying at the Pullman Holiday Inn Express. In Roseburg, Oregon, the Holiday Inn Express has four rooms each with an accessible tub and one room with a roll-in shower; however, the roll-in shower room only has one King bed. The Holiday Inn Express in Elk Grove, California, has a roll-in shower but without a built-in seat. Instead, a guest would have to ask for a portable shower chair, if needed. The towels are not accessible as they are placed above the toilet. However, this room does have two queen beds with plenty of space in both the room and bathroom. At SeaTac, the Holiday Inn Express did not have an accessible room with two beds which forced Kyann and her party of four to have to choose between purchasing two rooms or purchasing an inaccessible room. The room they purchased is relatively accessible itself; however, the bathroom is not; it is the typical size just big enough for a standing person to turn around in; a wheelchair could not fit and the door was in the way of the bathtub. Even though the tub is not accessible, this Holiday Inn Express was willing to accommodate with a portable bath chair; however, the portable bath chair did not fit in the bathtub (it was actually a toilet chair). This hotel was willing to do something, but it equated to nothing. The Holiday Inn in Wilsonville, Oregon, has an accessible tub, but no bench. This did not provide Kyann with tub access. 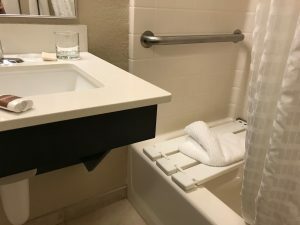 Even though Candlewood Suites in Medford, Oregon, has a tub with a bath bench, the bath bench is poorly positioned and not usable. So, just because the Candlewood Suites has a bath bench, it is no more accessible (to Kyann) than the Holiday Inn that did not provide a bench. The Staybridge Suites in the Fremont District in Seattle, Washington, and the Staybridge Suites in Sunnyvale, California, both have roll-in showers – commonly the most accessible, but also the most expensive. People with disabilities should not have to pay extra for access; it is discriminatory to force a traveler to choose accessibility over affordability and provided amenities. 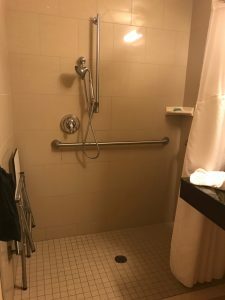 All the rooms in which Kyann stayed — except for the one at Holiday Inn Express at SeaTac — have standard bathroom grab bars around the toilet as well as plenty of space in the bathroom for Kyann to maneuver her wheelchair. Three of the accessible rooms have bath towels that Kyann could reach. The other two hotels place their towels too high; in one case, the towels were on a shelf above the toilet. 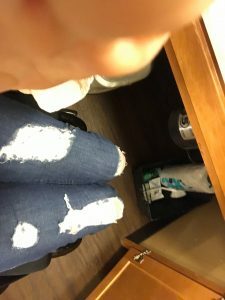 Even though Kyann did not stay at the Holiday Inn Express in Roseburg, Oregon, the picture her mom took reveals that the toilet and sink are too close together for someone in a wheelchair to be able to safely/comfortably transfer and the toilet is on the shorter side. This is supposed to be an ADA compliant room; however, it does not follow the standard compliance of the ADA. All the rooms range in size, Holiday Inn having the least amount of floor space and the Staybridge suites having the most. The Holiday Inn Express in Pullman had an average amount of floor space in Kyann’s room as it has two queen beds, but her grandparents’ room was a little more spacious as it was a king suite and has a pullout sofa rather than two beds. The room at Candlewood Suites is a little more spacious than the king suite at the Holiday Inn Express as it has a little bit better layout. All three of the suites have kitchen sinks that Kyann was able to roll under, but only one of the Staybridge Suites and the Candlewood Suites have a microwave she could reach. The open area under the kitchenette sink at the Candlewood Suites in Medford, Oregon. Both the non-ADA compliant rooms at the Holiday Inn Express in Roseburg, Oregon, and Seattle (SeaTac), Washington, have sufficient space for a manual wheelchair. All the accessible rooms — except the room at the Roseburg Holiday Inn Express — can sleep four and the room at the Staybridge Suites in Sunnyvale can even sleep six. This is thankfully becoming a more popular trend as not that long ago it was extremely difficult to find an accessible hotel room with more than one bed. There are still states and hotel chains that have still not realized that people with disabilities travel with their families or in groups. However, props to IHG (at least on the west coast) for catching on and catering to more people. 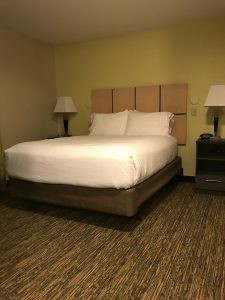 The other thing that IHG seems to have done (at least on the west coast) to cater to people with disabilities is they have thankfully not followed the trend of high platform beds, creating a double whammy for the disability community. Beds that are on platforms do not accommodate anyone who needs to utilize a Hoyer lift to transfer, and beds that are too high do not accommodate to people who transfer themselves to and from their wheelchair. The beds in all the rooms in which Kyann stayed have space for a Hoyer lift to roll under, and the beds are not ridiculously high. However, this is unfortunately not specified anywhere when booking and hotel personnel may have no idea what you are asking when you address this topic of bed accessibility. The rooms with pull-out sofas also give people another option if the bed is too high as sofa beds are typically lower. 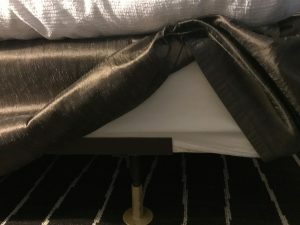 But, having adjustable beds is the ultimate solution to providing all people within the disability community to get in and out of bed when staying at a hotel. The bed at the Candlewood Suites in Medford, Oregon. The open space under the bed. Kyann checked out two of the hotels’ pools, and her parents checked out a third. The Holiday Inn Express in Pullman, the Holiday Inn Express in Roseburg, and the Staybridge Suites in Sunnyvale, all have lifts. Kyann does not know if the other hotels have lifts, or if they even have pools for that matter. The continental breakfast areas at all of the locations that provide breakfast are accessible. The bathroom doors at both the Staybridge Suites have pocket doors which magnetize shut when closed. Like Kyann, for anyone with dexterity issues, it is very difficult — if not impossible — to open the magnetized doors. The sidewalks at the Staybridge Suites in Sunnyvale, California, are the main source of traveling throughout the hotel campus; however, due to trees and age, these sidewalks are bumpy/uneven. Like Kyann, this is a hazard for people who utilize mobility aids and/or have legal blindness. The transition from the kitchenette to the living room at the Candlewood Suites in Medford, Oregon, was unnecessarily large and cumbersome for Kyann to push across. This could also be a hazard for someone who has balance and/or visual issues. The accessible parking at the SeaTac Holiday Inn Express is not located near the accessible main entrance. There is an alternative route; however, this route requires the use of an extremely old lift in order to access the mezzanine and then the use of an elevator to get to the front desk — one floor below. Even though it is incredible that there is a range of accessibility options, as accessible is not “one size fits all”, hotels do not always specify what their mobility/accessible rooms entail. People with disabilities need to do a whole lot of extra work just to find a room that fits their accessibility needs. This is discriminatory. Travelers with disabilities have to contact the hotel directly and request the specifics of the room they are booking; many times they do not get the correct information via the phone causing them to book a room that is not accessible to them. If the hotel employee does not know what each specific accessibility feature is, you must insist that the hotel employee look at the room and give you feedback so that you are accommodated correctly. Overall, the hotels under the IHG umbrella are relatively accessible in comparison to other hotel chains. However, the accessibility accommodations offered from hotel to hotel vary so greatly that a person with a disability can book a hotel and even with research can show up having no idea what they are going to experience accessibility wise. This is where AbiliTrek comes in. Use our accessibility platform to rate and review every hotel, every restaurant, and every business you frequent so that the next person has a better understanding and confidence of what they are going to find when they travel. Visit our platform at http://abilitrek.com to help the disability trek without boundaries.